I cannot believe that we’re in November already. Seriously. October absolutely flew by and left me wholly unprepared for November. But at last, I have drawn up a pretty little bullet journal monthly spread that makes me finally feel ready to take it on. So let’s dig in, shall we? 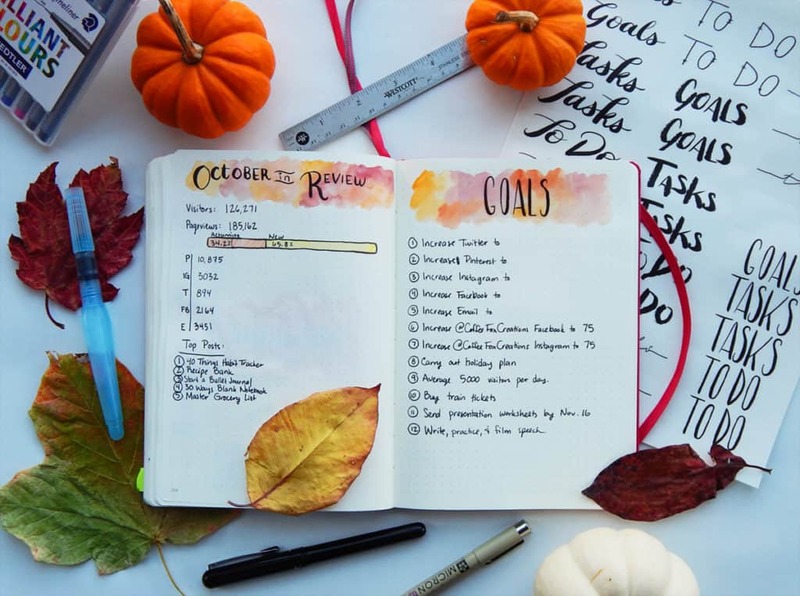 One of the reasons I put off setting up my bullet journal monthly spread was because I was a bit bored of the usual set up and didn’t know how I wanted to change it up. I’ve been thinking about it for a while, but I settled on a few subtle and not so subtle changes that I think are pretty neat. First and foremost, I used my gold Finetec watercolor palette! I’m pretty much obsessed with this palette, but Moon Gold (the one I used here) is perhaps my favorite. If you love gold or watercoloring at all, this set is amazing and I highly recommend it! I also changed some formats of common spreads and used a few more new tools, but let’s dissect it piece by piece. 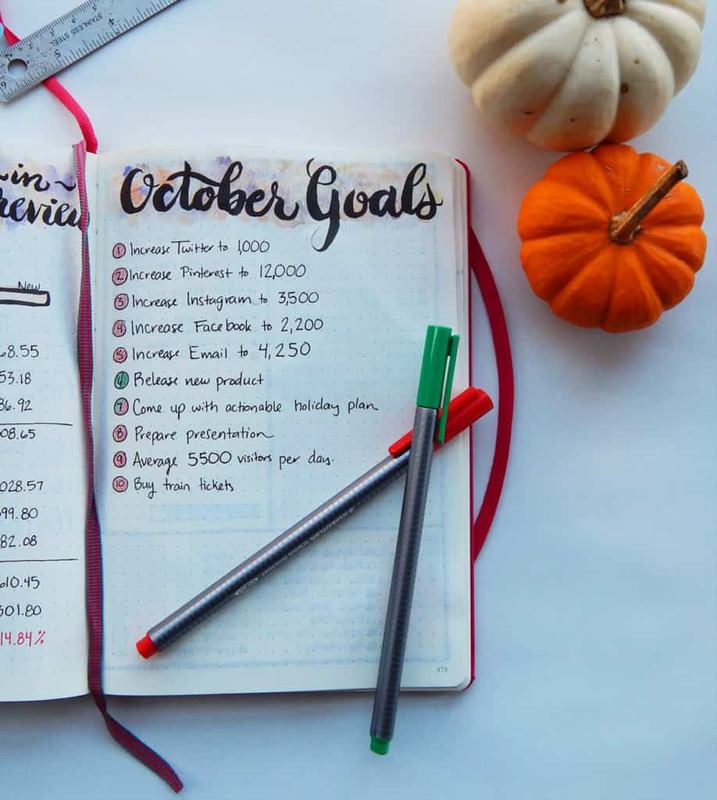 October was a mad, crazy, amazing month for me. So many great things happened and I devoted myself to my new sticker shop Coffee Fox Creations. I have spent more time with stickers in these last few weeks than I am comfortable saying. The stickers and I know each other’s secrets. We’re very close. So how did it effect my numbers? Anyway, I spent so much time on getting the shop ready that I didn’t spend as much time as usual on the blog. Or myself. Or anything that required time (you should see this stack of laundry). My October data sorta shows that fact,too. I didn’t do a great job of hitting my personal goals. Whoops! So close on so many goals! But my Habit Tracker doesn’t look too spotty. There’s several lines of nearly solid Staedtler color! I did, however, do a much better job about filling out my Gratitude Log and Habit Tracker than in past months. So go me! I also tried something different with my Memory page. Not hugely different, but different! 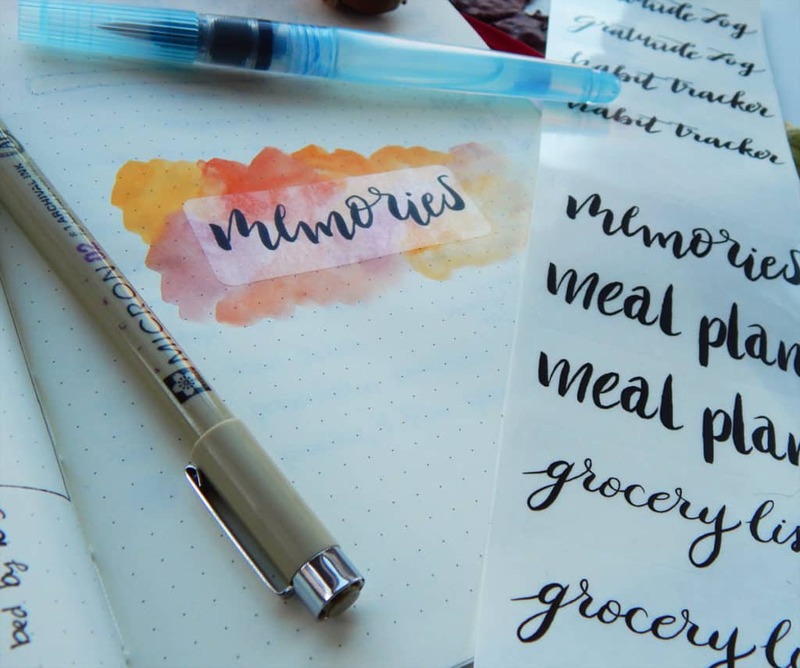 I recently got this nib set, so I thought I’d have fun and use one of them to write out my memories the old-fashioned way! I used some old calligraphy ink I had lying around and felt like a dandy! If you have never tried dip pens then you have not known this peculiar Harry Potter kind of fun. Then we have my blog goals. Oh dear. I had such high hopes for October! I got all caught up in achieving the one goal of launching a new product that I sorta sacrificed the other goals. I more than sacrificed them. I threw them into a volcano to pay tribute to the sticker shop. I mean, totally worth it. The stickers look amazing. But yeah. Not my finest month in terms of numbers. 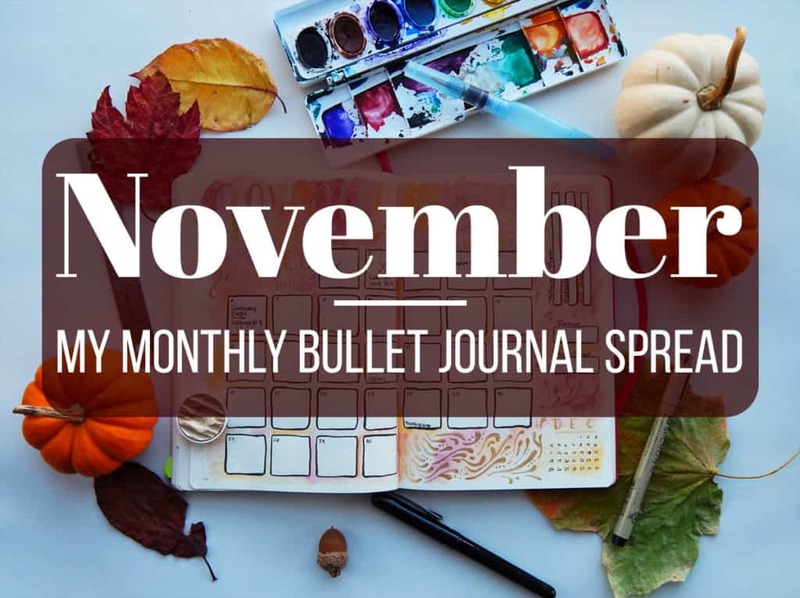 Without further ado, let’s look at my November bullet journal monthly spread! I drew out my calendar boxes freehand with my Pentel Pocket Brush Pen (after measuring them with my baby ruler, of course!). Then I went wild with my Prang watercolors and my Pentel Aquash Water Brush Pens. Perhaps I went overboard. But I wanted some pizzazz, and I delivered the pizzazz! Besides, I’m nearing the end of my Leuchtturm and I’m feeling like pushing the limits a little bit. And it can handle more than you think. 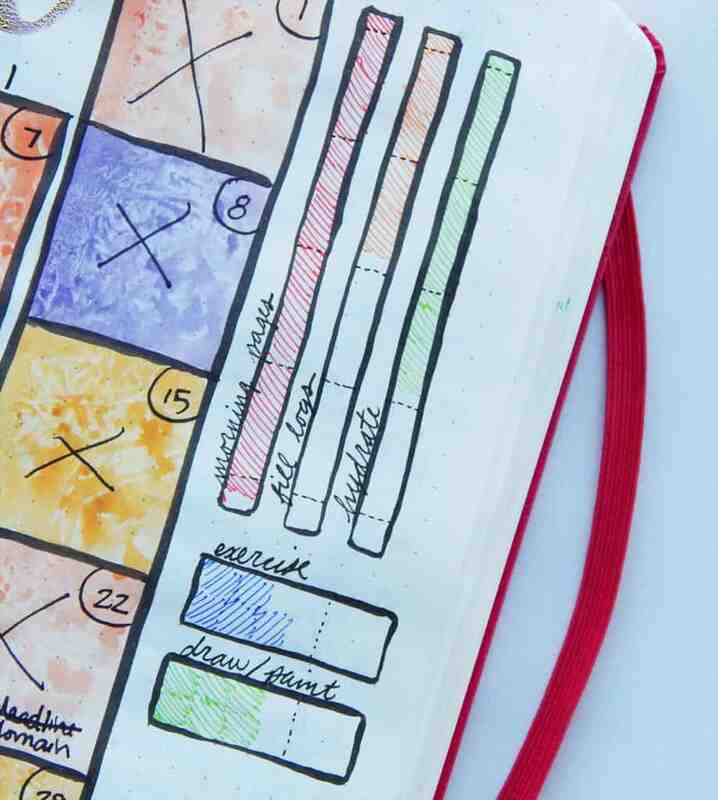 Check out my post about the basics of using watercolors in your journal. It’s less scary than you think, believe me! I also used my trusty Microns to write in the detail. These don’t buckle or bleed under water, so they’re safe with the paint! Like I said earlier, I kinda went nuts with the Finetec gold. But can you blame me? It’s so gorgeous! Here, check it out on an angle to get the sparkle. I added the little thumbnail of next month again. I just really like that thing, I don’t know why. I’m freaking out a bit about Christmas being so close and me having no idea what to do for gifts, but…. you know, that’s just a problem for future Shelby. Especially with balancing my vacation budget for Las Vegas this Christmas! 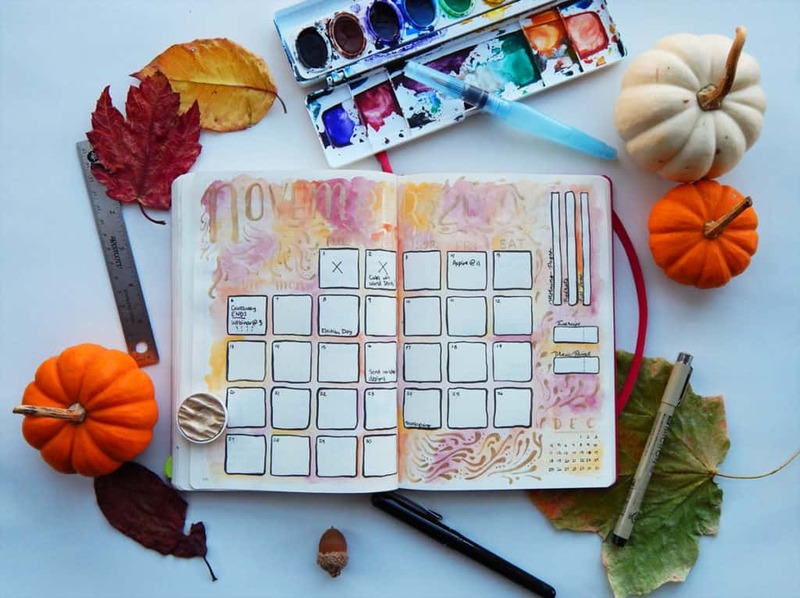 After my calendar page, I made a pretty significant change to my bullet journal monthly spread set up. Usually I jump right into my Gratitude Log, but not this time! 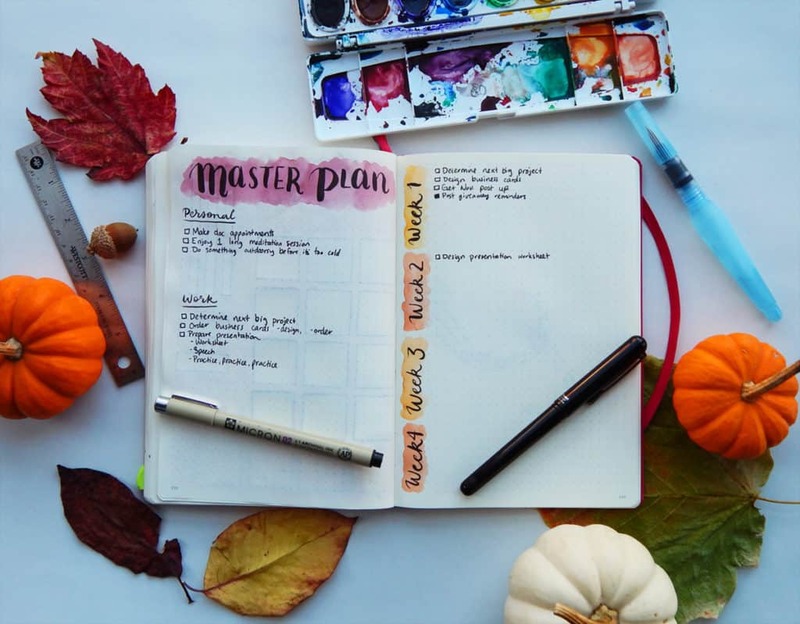 I have really struggled with future planning and breaking big tasks down to smaller tasks in advance. So I implemented a master list (not to be confused with the Master Grocery List – totally different) with two categories: work and personal. This will allow me to pull tasks from my future log, break them down, and distribute them evenly among my four week sections. That way deadlines don’t come and smack me in the face like they usually do. I’m trying to get a decent scope on my big plans and how I can make them happen bit by bit. 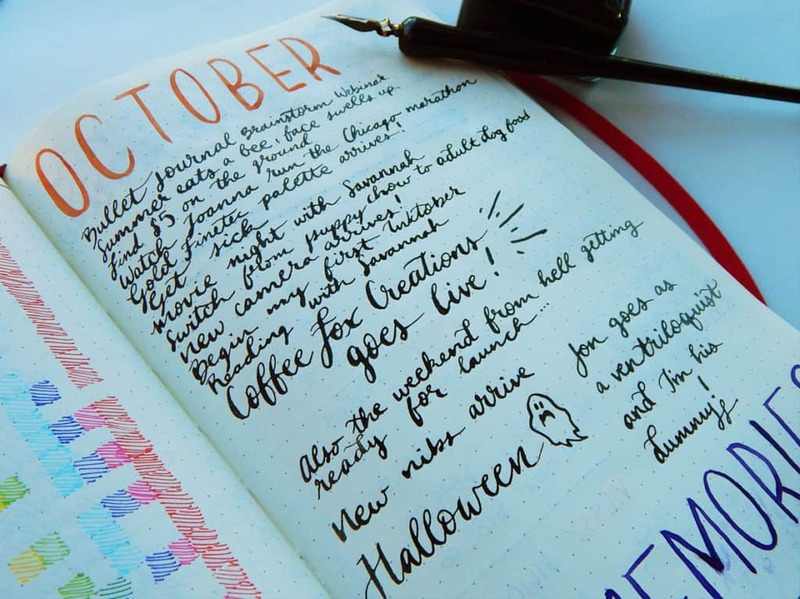 November gets to be a guinea pig for this style of planning. I feel pretty confident about it. I’ll report back in December! After my master plan (which was lettered with the pocket brush pen, BTW), I have my Gratitude Log. But wait! It’s all different! I was super bored with the tired old list that I’ve been doing for months and months. I decided to give a neat little free flow design a try. 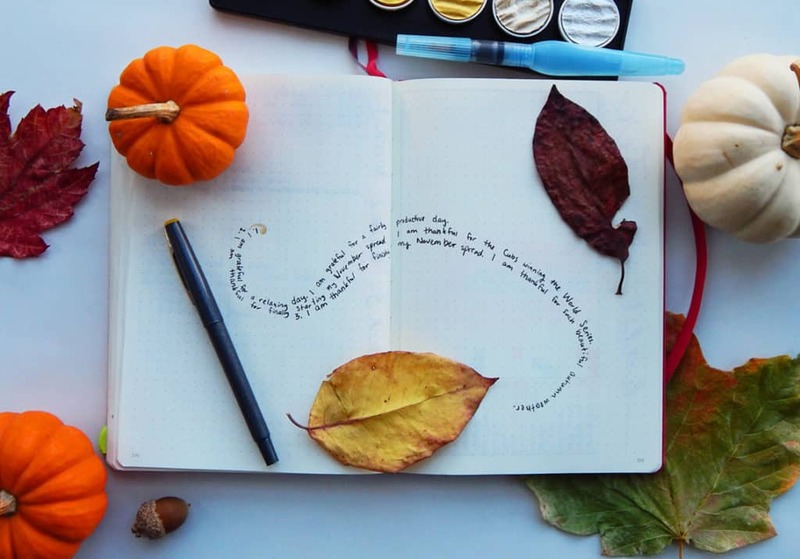 As I write each day’s two pieces of gratitude, I’ll decide how I want the shape to grow. Hopefully this makes me really think about how thankful I am with more depth and create a beautiful spread in the process. We’ll see how it goes! I feel super fuzzy and giddy about it. Is that weird? 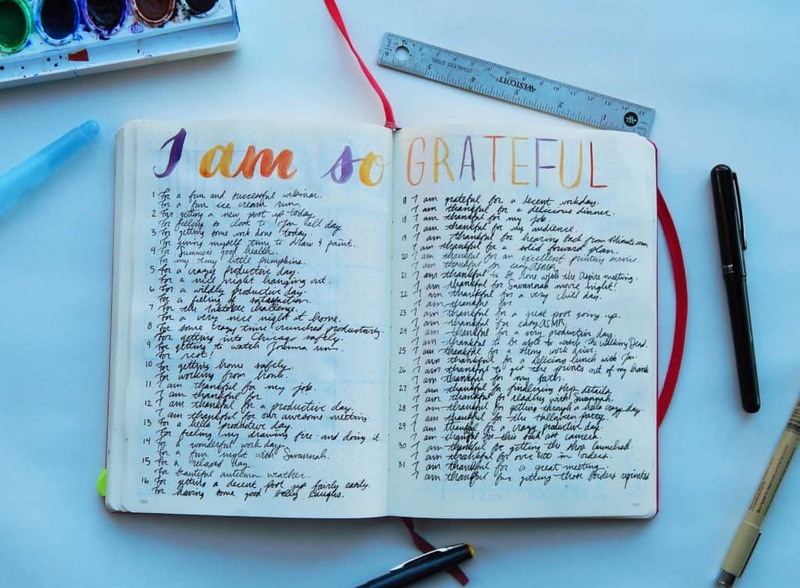 Yo, if you want to keep your gratitude log in its original list format, be my guest! 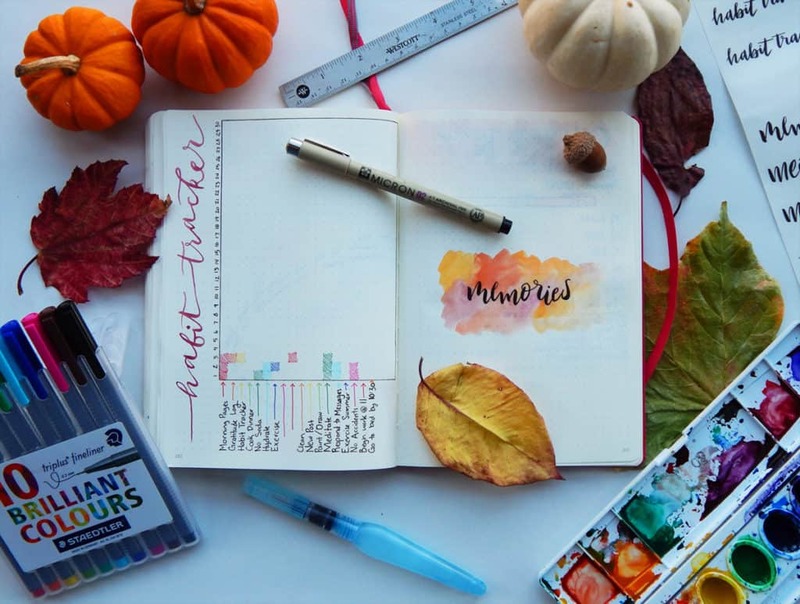 You can always sign up for the Fox Den Resource Library right here and grab your own printables for the gratitude log and the habit tracker, to list a few. Go snag them now! 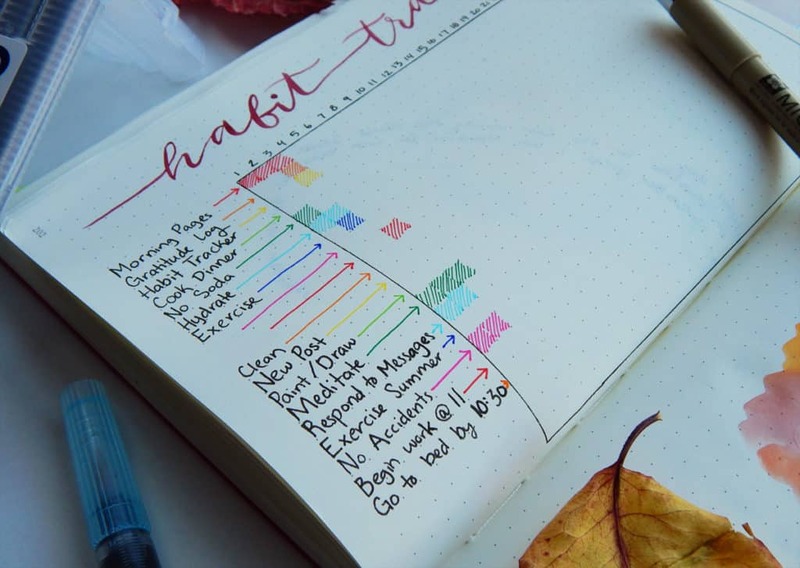 Then we have the standard Habit Tracker. Nothing huge has changed here, but a few details did get a mix up. 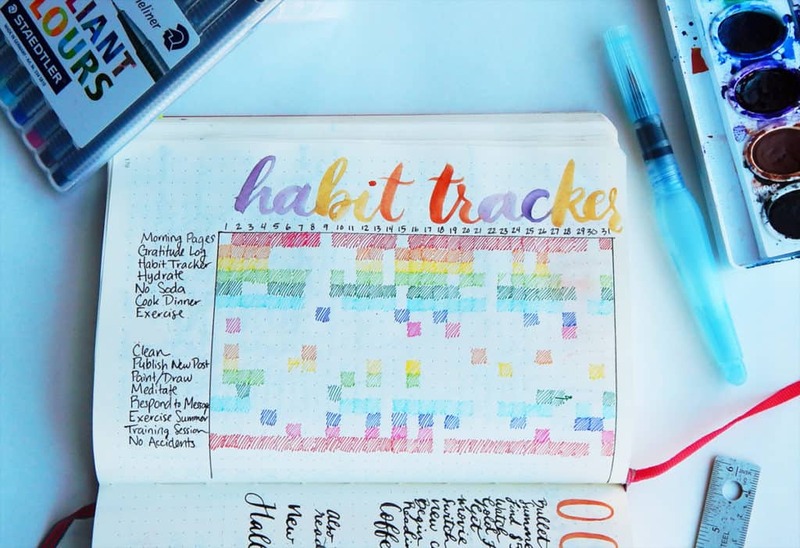 Obviously there’s the colorful arrows next to my habits, which are totally utilitarian (but super cute too). In the early parts of the month, I usually have to count out the colors so I keep the rainbow in order. I decided to make it easier on myself and just mark them already! Turns out that I kinda love it. I used my Staedtler Triplus Fineliners, if you hadn’t guessed. 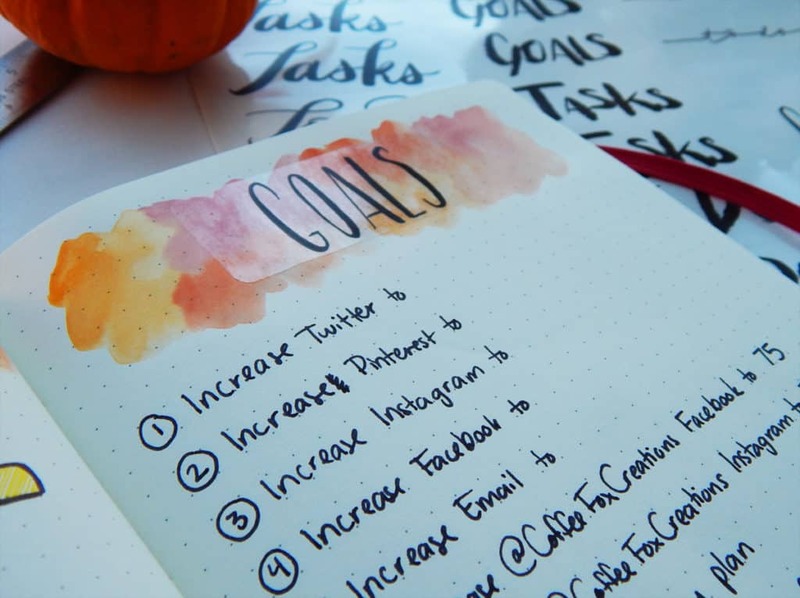 They are my go-to for filling in my habits, goals, and other miscellaneous data! You also might notice that I added a few habits: Begin work at 11 and Go to Bed by 10:30. I would totally start working sooner, but Jon needs a ride to class, which begins at 10:30. I don’t sleep in THAT late, guys, jeez. I do, however, stay up stupidly late. Every. Single. Night. So I’m spending the next month imposing a bedtime like we are children. Adulthood is a very sleepy thing, and I won’t let it win! And here, my friends, we have my Memory page. Notice anything…. glossy? No? Look again. IT’S A STICKER!!! Totally fooled ya! I used a clear sticker and laid it over a dried wash of watercolor. And it looks pretty darn fabulous, if I do say so myself. I’m gonna be honest: I didn’t quite fill out this page. I began to, got sidetracked, and took pictures before I noticed the missing data! It was dark when I realized, so these are the pictures I have. Sorry! I can tell you that my blog did experience a little bit of a hiccup in numbers. Nothing too crazy, but visitors did drop by a few thousand. I’m not worried, though! I’m sure that it was because of my wild sticker craze, so I’m confident that I can work hard and bring those numbers up in November. That’s just the life of a blogger! Over on the goals side, you can see yet another sticker. Find it? They’re like well camouflaged lizards, I tell ya! While I may have been resistant at first, I think I’m ready to take on November. Letting go of Halloween is hard for me, so it takes a little bit of time. Soon enough, though, it’ll be Thanksgiving time. Then very quickly it will be Christmas time, Las Vegas time, and New Year’s Time! So it’s not all bad. Honestly, I’m just ready for November 8th to be done so I can stop thinking about politics and get back to normal life. The election cycle has been exhausting and I’ll be thrilled when it’s finally over. Plus, I have some plans that I can’t wait to put into action! So what do you say? Let’s go knock November’s socks off! I love your spreads, they are gorgeous! 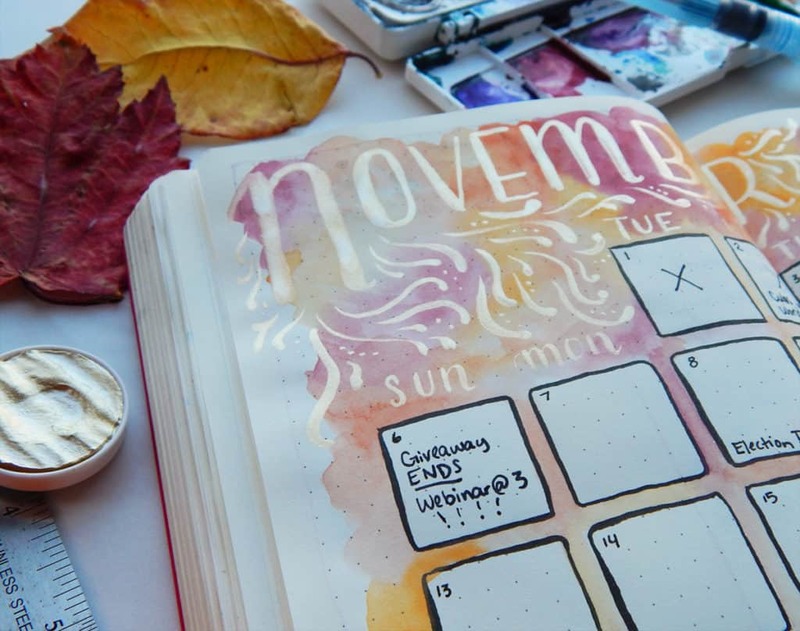 For your November monthly spread, did you carefully paint around the day boxes, or did you use some kind of paint repellant? And where did you get those lovely transparent labels? 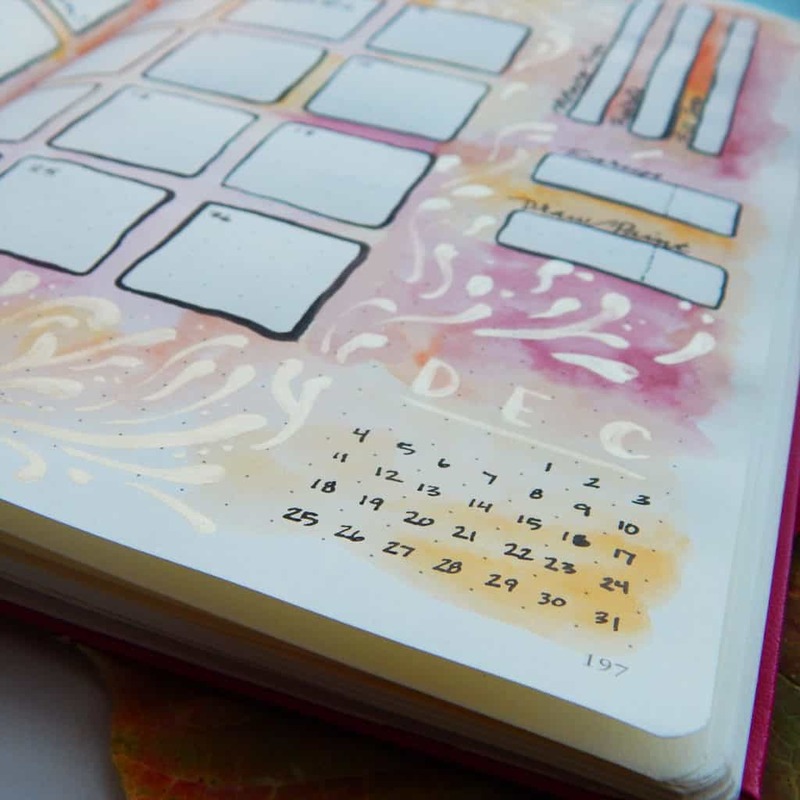 Ooh, your monthly spread is absolutely beautiful! I love the idea of a master list, too. Thanks, Nicola! I’m pretty happy with how November turned out 😀 I’m crossing my fingers that the master list will work for me! This is absolutely lovely! I have no talent for anything artistic any more (I used to be able to draw but these days I feel uncomfortable with even the most basic doodles, I’m afraid) but your layout is just lovely! Thank you so much, Rebecca! I understand how that can feel. I went through quite the drought of creative drawing/painting/doodling, but I got through it eventually. I’m sure you’ll find your way back to feeling comfortable!